DryCASE for phones and tablets! This crystal clear, waterproof, case allows complete use of your phone or tablet while keeping it protected in a vacuumed sealed bag. The air tight seal guarantees that the contents of the bag will stay dry even when submerged underwater. 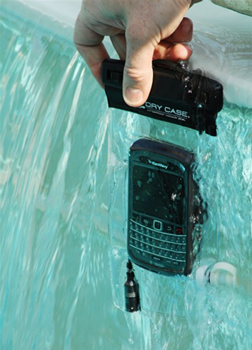 DryCASE for phones comes with a built-in headphone jack and a neoprene activity arm band for water sports. Protect your phone or tablet with this great new product, please visit our DryCase Waterproof Phone Case webpage or contact your Export Manager to place your order!